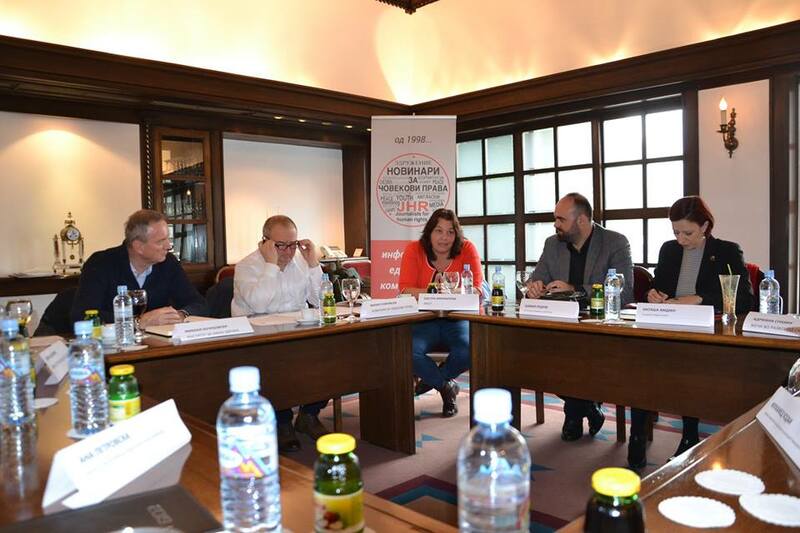 CSO – Journalists for Human Rights on November 20 organized the round table “The right to water as a basic human right-time for Constitutional protection”. 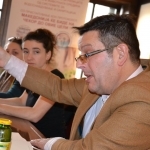 The purpose of the round table was to encourage public and expert discussion on the need to protect the human right to water in the Constitution of the Republic of Macedonia. Macedonia, without discrimination, financially accessible and health-correct. At the round table, which was attended by representatives of the Macedonian government and experts in the water sector, was promote the initiative water to be introduced into the Constitution of the Republic of Macedonia as a fundamental human right. 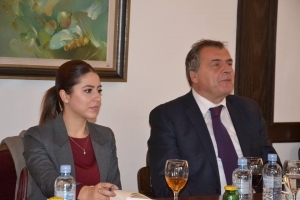 Deputy Prime Minister in the Government of the Republic of Macedonia Macedonia, prof. Zoran Sapuric said that in Macedonia, human rights are generally respected and protected in the Constitution. Regarding water issues, prof. Sapuric emphasized that Macedonian legislation is not fully transposed with the EU legislation and that there are open issues to be addressed, but that in principle Macedonia respects and practices the right access to drinking water.According to the Deputy Prime Minister in Macedonia, nobody will oppose the entry of access to water into the Constitution as a fundamental human right, but that a more relaxed atmosphere is needed. Prof. Kochubovski from Institute for Public Health pointed out that all preconditions need to be met in order to come to the Constitutional changes regarding this issue. Among other things, according to Kochubovski, Macedonia must first officially ratify the UN Protocol on Water and Health, equalize or bring the legislation closer to that of the EU. Although most of the laws and measures envisaged in the Protocol are applicable to us, officialization is needed, and only then, on “healthy grounds”, we can go to this initiative. Prof. Kochubovski said that although the Protocol was finally to be ratified this year, it is expected that it will be next year. Representative of the Energy Regulatory Commission Shamil Rexhepi, a body that has its own authority a water, said that the water was taken from their institution by a chaotic situation, because, as he pointed out “we have a product, water, but we do not have adequate service” , referring to poor water management. According to him, it is much more important to complete the water reform, because if only one citizen left unattended, than will not be able to get water reform! 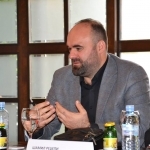 Rexhepi added that first we need to build the basis for responsible use of water, and then only strive to enter it as a constitutional category. 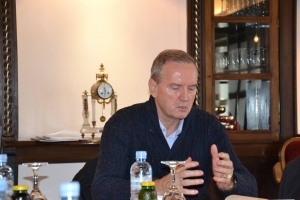 On this, the representative of the Ombudsman’s office, Muhamed Hodai, pointed out the situation in Tetovo and the problems that the citizens had with regard to payment of the bills. They allow them to reach an executor, not taking into account the fact that timely and complete billing is necessary. The biggest complaints from his institution relate to this civil problem in relation to water. Natasha Amdiu, lawyer and independent expert, starting from the social component, proposed a cumulative tax collection as an example of how to cover the social aspect of access, payment of water. 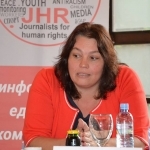 Natasha Docovska from – Journalists for Human Rights pointed out that Macedonia should be a good example in the region and use the high percentage of equitable access to water and sanitation and from that conclusion to start talks on initiating constitutional deception in the direction of water for personal use to become a fundamental human right guaranteed by the Constitution. Bistra Mihailova from WECF shared experiences with EU member states and Bulgaria and presented the project for small water systems implemented in Macedonia, Albania and Romania. The right to water as a constitutional category is not something unattainable. Journalists for Human Rights through the WatSanPlan Project, which is implemented in cooperation with WECF, Aquademica and Women in Development from Shkoder, and supported by the Ministry of Environment of Germany, will continue to work on this issue because Macedonia is prepared for water and sanitation fundamental human right to put them in the Constitution. The recommendations of the World Health Organization are that every person should have access to drinking water with a certain quality and quantity of about 70 liters a day, explaining that the right to water is not limitless access to free water, but access to water for personal needs. So far, there have been three proposals for the constitutionalization of human rights in the EU, in Belgium, Italy and Slovenia. Slovenia is the first country in the EU to guarantee the right to water by 2016 with a constitution, while Belgium, the country where the human right to water has been maximized, says that the constitutionalization of this right is not a focus of interest because very well protected human rights, so all citizens have 15 cubic meters of water a year free of charge. At world level, 15% of the usual water supply services have private suppliers, and after serious privatizations with the rise in prices and the exclusion of service users in individual countries, there is now a tendency to return water supply to the public sector. Natasha Amdiu – Independent Legal Expert. Andrea Nakova, CSO JHR, Volunteer – technical support.